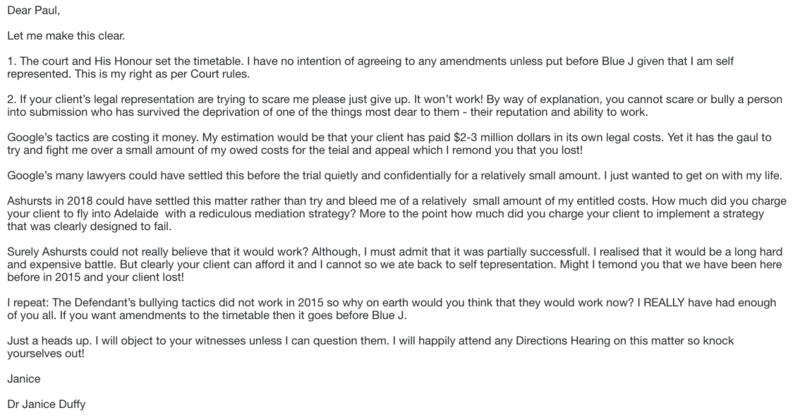 I am self represented again because the Defendant Google has not yet paid any of my costs from 2015. I have no income and no choice but I do have evidence. The matter is moving to argument before the Supreme Court in September 2018. I am asking for an Equustek type injunction. 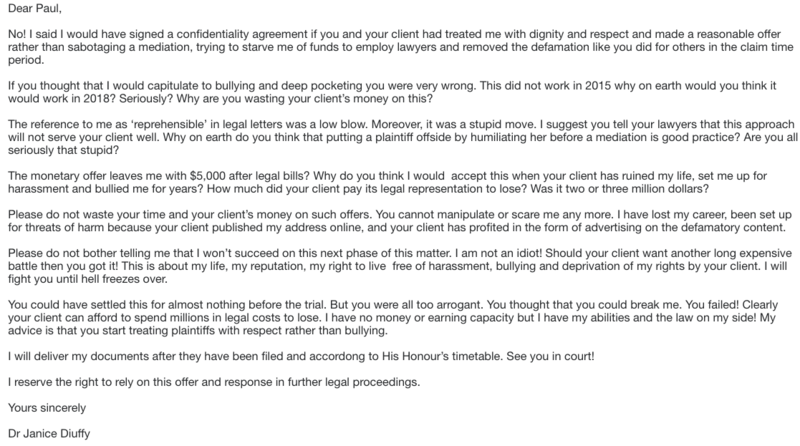 The Defendant is challenging me on section 21 of the Defamation Act, South Australia, 2005 and is going to file for a Summary Dismissal. I am unsure of the grounds for this and I am not a lawyer but I am sure that I have evidence that will challenge the Defendant’s attempt to pervert the facts. 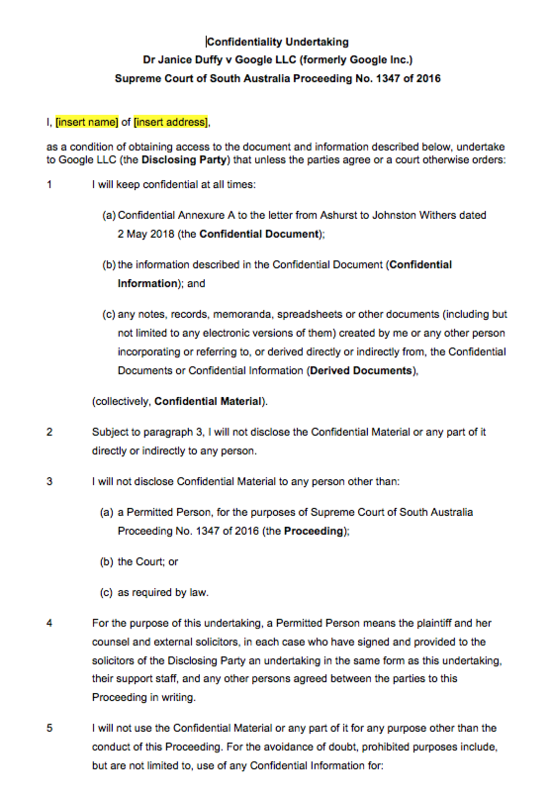 Ashurt Australia want me to sign this confidentiality agreement. Given the difficulty reading screenshots, this is a link the confidentiality document that they want me to sign on Scribd. 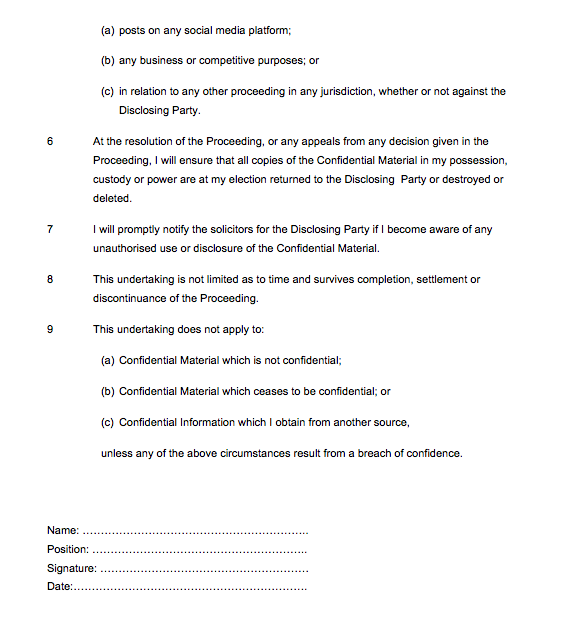 I adhered to all the confidentiality agreements that the Defendant’s lawyers made me sign before the 2015 trial (and from 2011). But Google published my address online on a court document via a third party in early 2017 which resulted in threats of harm delivered to my house. I had to go to the police. Maybe I am paranoid, but the website, Lumen Database, redacts personal information before it publishes its notices. The exception seems to be for plaintiffs that win against Google in court. A German plaintiff had to obtain a court order to remove his information from that website. Could this be a case of punishment and dummy spits by the defendant Google? So by publishing Google’s documents online it is a case what’s good for the gander is good for the goose – right! This is a link to my complaint to the Australian Information Commissioner. It explains the publication of my address on a legal document by Google through a third party and some of the subsequent threats. 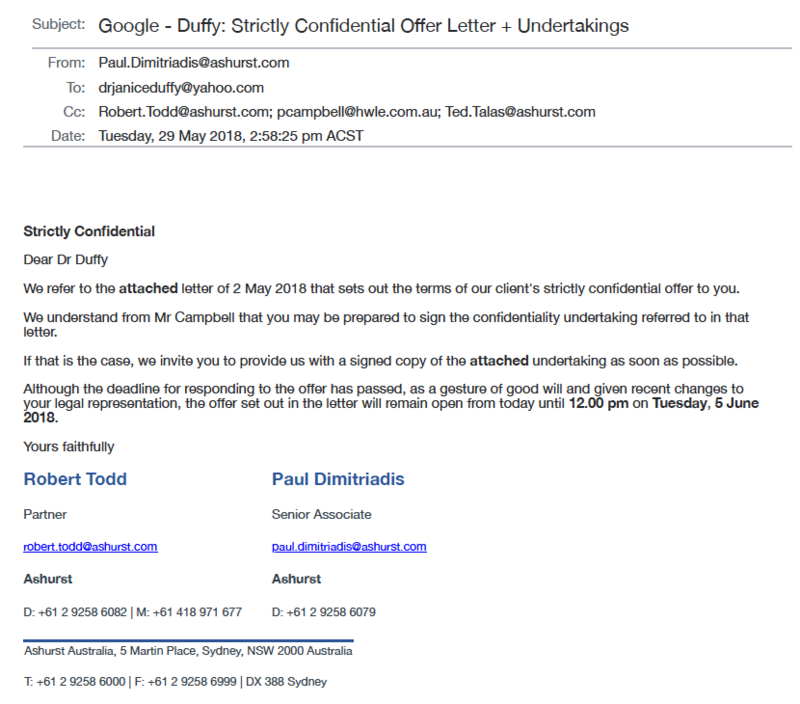 So Google and its lawyers seriously think that I will sign this? I sat in the car in the rain on my way home from delivering a rescue dog and replied to Google’s lawyers. I have to say that it took me awhile to compose myself. At first I was in tears (its been a long battle – it has taken a huge toll on my health – I am very, very, very, tired – but I am still standing) but then I just couldn’t stop laughing. Remember, Google has paid $2-3 million dollars in its own legal fees in this matter – and lost! My defamation matter set a global common law legal precedent at the level of the Appellate Court. Ya think Google or its lawyers would realise that its tactics are failing? Clearly not!! Let us see what happens. This is my position as outlined in three emails (excuse the spelling mistakes – tears in my eyes and was on my iPhone). Oh and here is a fun fact: The boss of Alphabet, Professor John Hennessy does not use Google products. He uses Apple and Firefox. I wonder why? Could it be that he is worried about security or spying on his privacy by Google? Watch this space for more details coming soon! I realise the screenshots are hard to read so I have uploaded them onto Scribd.com.